A friendship card, quite often I send a card as a notelet or pop one in a package I'm sending, purely because it doesn't have to be an occasion to send someone a card, I think everyone enjoys receiving one. This started out as a 15 x 15 cm card then by scoring down at the halfway mark on the front facing cover and then bending it back you now have a concertina card I then cut out the brown card at 14.5 x 14.5 cm for the insert and 14.5 x 7cm for the front and again cut some cream card a little smaller than both pieces. I used the Rollergraph script stamp wheel and scattered straw distress ink pad and rolled the stamp over the insert cream card then using some sponge in a circular motion dabbing it into the ink I distressed both pieces of the cream card. I then stamped both pieces of card using flower stamps and a sentiment in a close to cocoa ink, the front piece with the sentiment on then had 2 semi circles punched out at the top and the bottom of the card. I finished by adding ribbon. Lovely card Jak, I've just sent a thinking of you to a dear friend who I don't get to see much of in person. She loves receiving them. Beautiful card Jak, so delicate and a lovely verse. How beautiful and how simple to change the style of the card. I will remember that tip...thanks for sharing. Gorgeous card Jak. Love the design stamps and the sepia. Simply stunning card. Love the colours. When you look at this card, it is very soothing. The tonal colors give it an understated elegance and all of the details just add to its sophistication. I love the overall effect of the sepia tones and the cutouts and the rollagraph.. and the.. and the... Can you tell I really, really like this card? Great job; thanks for the inspiration. You outdid yourself! 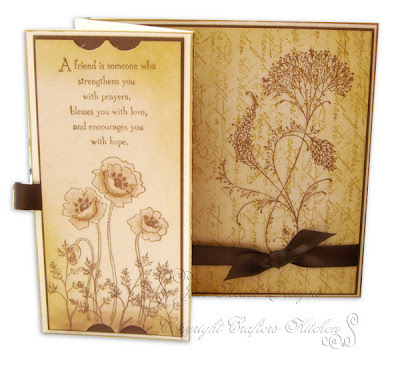 Sepia always looks very classy I think and this card is serene and beautiful. My oh my Jak, this card is too beautiful for words! How lovely it would be to get this in a package!